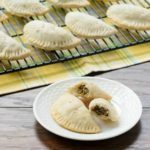 A recipe for beef and pork empanadas, a savory crescent shaped pastry popular in Latin America. These are baked and served warm or at room temperature. Heat the oil and butter in a skillet over medium heat. When the butter has melted, add the celery and onion. Sauté until translucent. Transfer to a large bowl. Brown the ground beef in the skillet, stirring often to break up the beef. Drain off the grease. Add cooked beef to the bowl. Brown the sausage in the skillet, stirring often to break up the sausage. Do not drain. Add cooked sausage to the bowl. Mix together the salt, black pepper, cayenne pepper, and red pepper flakes in a small bowl. Sprinkle over the contents in the large bowl. Add the drops of Tabasco sauce and stir to combine ingredients. Refrigerate mixture for several hours or overnight. The butter and sausage grease should cool and harden to help hold the mixture together. Whisk together the flour and salt in a large bowl. Add the shortening and cut it in using a pastry blender, fork, or with your fingers until the shortening bits are about the size of peas. Add the water and stir to bring the dough together. Shape the dough into a round disk and cover with plastic wrap. Chill the dough for at least one hour. On a lightly floured surface, roll out the pastry dough to the thickness of a pie crust, a little less than 1/4-inch. Cut the dough into 4-inch circles. You can pull together and re-roll the dough pieces (note those may have a slightly different texture). Brush water on the edge of a pastry circle. Place about 1 tablespoon of filling in the middle of the pastry circle. Fold over the pastry and press down to seal the edge. Use a fork to crimp the edge. Repeat using remaining pastry circles. Place empanadas on a baking sheet. Use a fork to punch holes in the top of the pastry to allow for release of steam while baking. Bake for 25 to 30 minutes, until the edges are very lightly browned. Transfer empanadas to a serving platter or cool on a wire rack. Serve warm or at room temperature. The pastry recipe will make about 18 empanadas. You will have a good amount of filling leftover. The filling can be frozen for future use or you can make more pastry to use up the filling. Empanadas can be frozen prior to baking. (Defrost before baking). If you prefer a more golden brown pastry, brush the tops of the empanadas with an egg wash prior to baking.